If you’re not incorporating a chatbot into your website design, then you are already behind. The age of robots is now and the more people interact with them, the more they will realise the value of humanless interaction. What exactly is a ‘bot’? 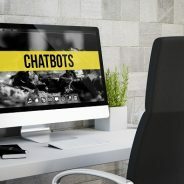 A bot is a computer program that automatically automates certain tasks, typically by chatting with a human through an interface. Bots plug into messaging and networking apps, and can play into larger strategies of tracking trends and consumer behaviour. People shop and buy in a world of immediacy. Messaging is how they communicate. Having an app simply doesn’t cut it anymore because half of smartphone users download a whopping 0 apps per month. Chatbots don’t require app downloads and people don’t have to pick up their phone to talk to an ill-informed service rep. By chatting in a familiar conversational interface, bots know they need to solve a problem and do nothing more or nothing less. When chatbots are linked with a CRM, they get even smarter by leveraging past conversations to personalise their responses to a person’s unique situation and preferences. At a time where app usage and email efficacy are decreasing, chatbots offer businesses the opportunity to have one-to-one conversations at scale and customers a better way to interact with brands. Do you need help with your website design or development? Then http://www.wsioms.co.za/contact-us contact WSI OMS today.